As you can tell from verse 35, our ministry—in whatever capacity—is not merely about what we do for others, but about who we are in our relationship with God. Our ministry is first and foremost the fruit of our relationship with God, not what we do for other people. Ministers of the gospel are not monks, living in solitude with little to do with the people of the world; nor are they social activists, serving others to the detriment of their relationship with God. Small group leaders do not exist just to gather strangers into one room, without actually caring about the people who gather. First and foremost, group leaders must not be afraid to ask for help. Contact your Groups Ministry leader, or seek advice from a mentor. If you must, have someone substitute leading the group one week. Sometimes it’s okay to not be okay. The failure to prioritize our relationship with God and the refusal to rest will cause us to give in to the selfish demands or expectations of others, many of which will be “biblical” or “good” (vv. 36-37). The word “looking” in verse 37 carries with it the connotation of seeking to determine and control Jesus, not follow Him. Likewise, there will be those whom we minister to in our small groups who will demand things of us that may sound right or good, but are actually selfish and wrong for us and them. It’s only by remembering where our ministry comes from that we can be aware of such manipulation taking place. If we don’t remember this, we can quickly burn out. Finally, a great deal of small group ministry burnout is related to the level of notoriety present in our small groups. This is not about number of attendees, Facebook friends, a “small group shout out” from the pulpit, or even the number of people who are directly impacted by our ministry. Yet groups of all shapes and sizes can have high degrees of notoriety. In verses 38-39, the disciples wanted Jesus to capitalize on his notoriety as a miracle work right then and there. Yet Jesus refused to build His ministry according to what made Him famous. Rather, He built it according to the Father’s will. So quit trying to be “the best”—this will keep you from burnout. Rob Tims has been married to Holly for 17 years. They have four children: Trey, Jonathan, Abby, and Luke. He has served in the local church for 20 years as a children’s pastor, student pastor, and senior pastor. 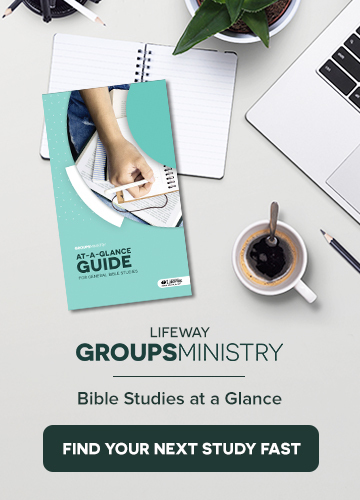 He currently serves on a team at LifeWay Christian Resources that develops customized Bible studies for groups and teaches two classes for Liberty University School of Divinity Online. He is the author of the book Southern Fried Faith: Confusing Christ and Culture in the Bible Belt.